Otters raise their heads in hello. Silver schools of fish flow and reshape through the kelp like mercury. Harbor seals bark their greeting. Or perhaps they’re barking a strong suggestion for you to slow down, breathe, and relax. After all, you’re on a Stand-Up Paddleboard. As you gently dip your paddle and glide across the water, ripples move beneath your board. The sun warms your face, time slows down, and your biggest concern is… nothing. This is what Stand-Up Paddleboarding (also known as SUP) is all about. If you’re ready to experience the simple joy (and it is pretty simple) of gliding on the ocean, here are 10 easy tips to get you from land to the sea and the joys that await you. While surfing is the activity most people think of when they think of ocean activities, we think its quiet cousin—Stand-Up Paddleboarding—has all the elements of an even better adventure. You don’t need to be super athletic. The initial learning curve is short and not too steep. It’s fun for a wide range of ages and abilities. You can experience the marine world—and the life waiting back on land—from another perspective. It’s quiet, peaceful, and relaxing. All you need is a sense of adventure, the right gear, and a good guide to get you started. It’s no wonder Stand-Up Paddleboarding (SUP) is one of the fastest-growing sports. It’s relaxing, easy to learn the basics. and is a good activity for the whole family. From the initial planning to how to, yes, stand up on your SUP, here are our tips to get you out on the water and experiencing the fun of SUP for yourself. Ready? Let’s head out for a SUPer time! Fishermen have been plying the seas standing up on floating rafts and small boats for thousands of years. It’s thought that what we consider the modern version of SUP started in Hawaii in the 1960s, but it didn’t start gaining popularity until about 20 years ago. As one story goes, Laird Hamilton and other pro surfers used SUP so they could continue to train when the waves weren’t good for surfing. Another story says that a group of surfers were floating on their boards waiting for a good wave on a day that had few good surfing waves. As they lamented the lack of action, one of them had a brilliant idea. How about if I stand up on my surf board? At least I could be doing something instead of sitting here in the water. It was fun. It had potential. The next day, he took a kayak paddle out with him, and SUP was born. Regardless of which story is true, the fact is that SUP is one of the fastest-growing sports in the world. And it’s gaining so much street cred it’s being considered as a new Olympic. I’m not sure why, but I (Flavor Team member Kara) have always been eager to try SUP, and it started way back when I lived in land-locked Colorado. When I moved to the Central Coast a few years ago, I tried surfing. It was fun, I caught a few waves, and I knew in my heart I would not become a surfer. SUP remained on my Must Do list, and the dream finally came true as part of my recent Week of Kara activities. (Yes, life’s too short to limit birthday festivities to a single day, for heaven’s sake, so I choose to celebrate for a week. Or two.) And lucky for me, fellow Flavor Team member Andrew and his family agreed to join me. The more the merrier when it comes to SUPer fun on a paddleboard! 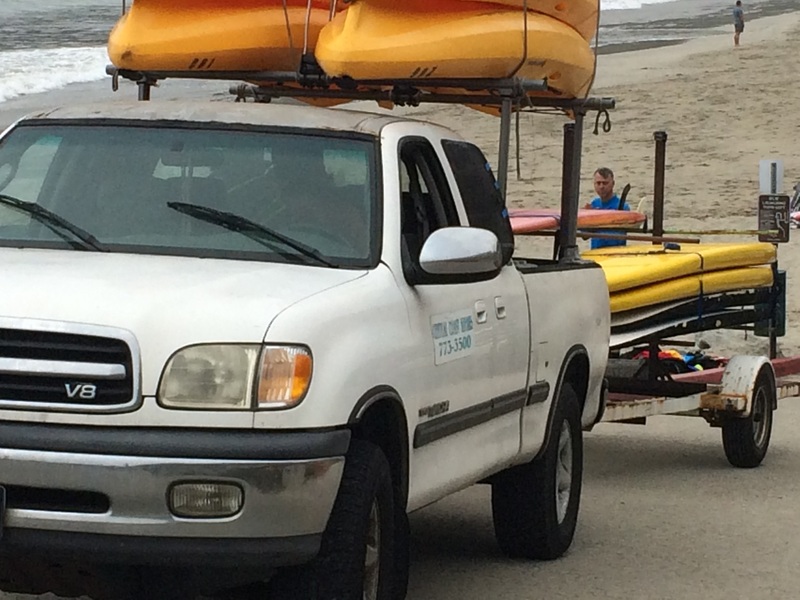 Tom Reilly, owner of Central Coast Kayaks, and his crew unload the gear for our inaugural SUP outing on Avila Bay. A few years ago, I first joined the San Luis Obispo Chamber of Commerce for my corporate writing business. At the second event I attended, I happened to meet Tom Reilly, owner and CFO (Chief Fun Officer) of Momentum Paddle Sports. We talked about SUP and kayaking and how much I wanted to try SUP. I took his card. I learned later he bought Central Coast Kayaks in Shell Beach and combined it with Momentum Paddle Sports. Two years later, I still had his card. 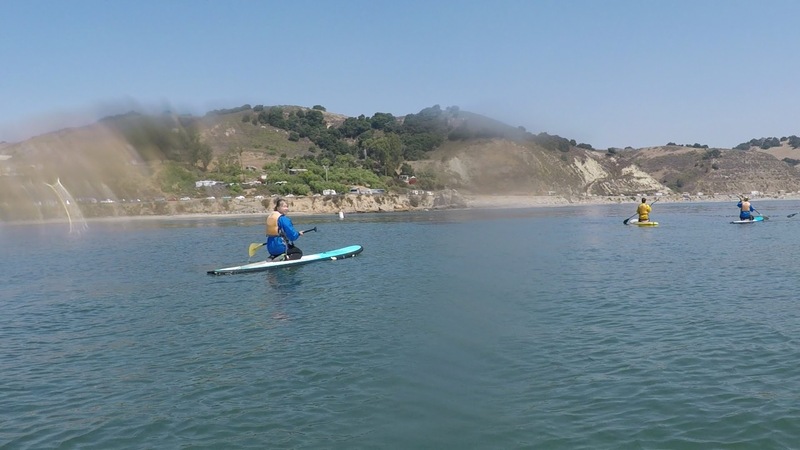 As the plans started taking shape for a group SUP outing during the Week of Kara, I called Tom to inquire about a group lesson and tour in Avila Bay. As a matter of fact, Tom is the only person I reached out to so this dream could become a reality. 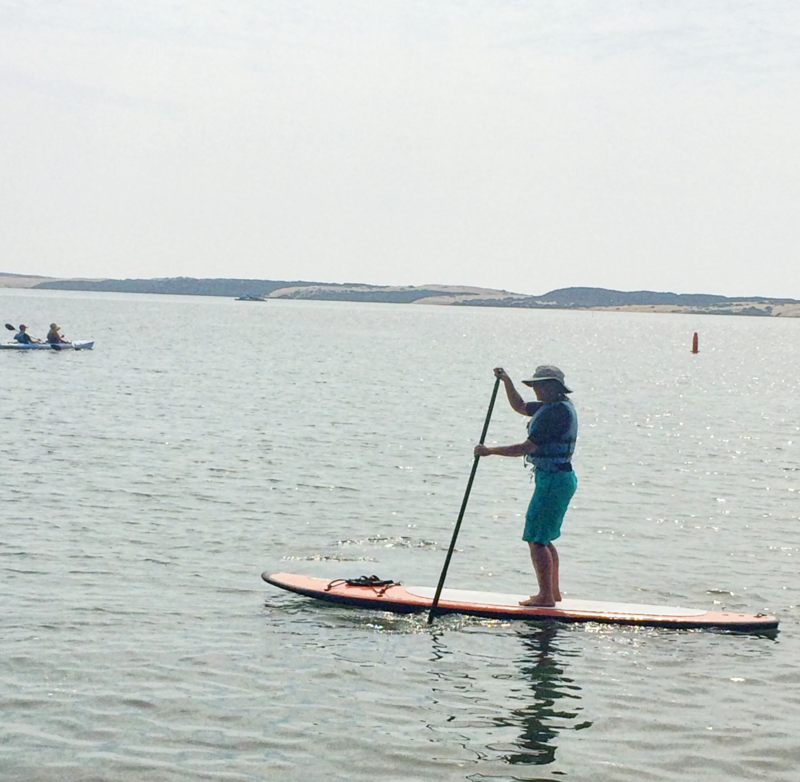 We want you to experience the fun and success we had on the inaugural Great Flavors SUP outing. 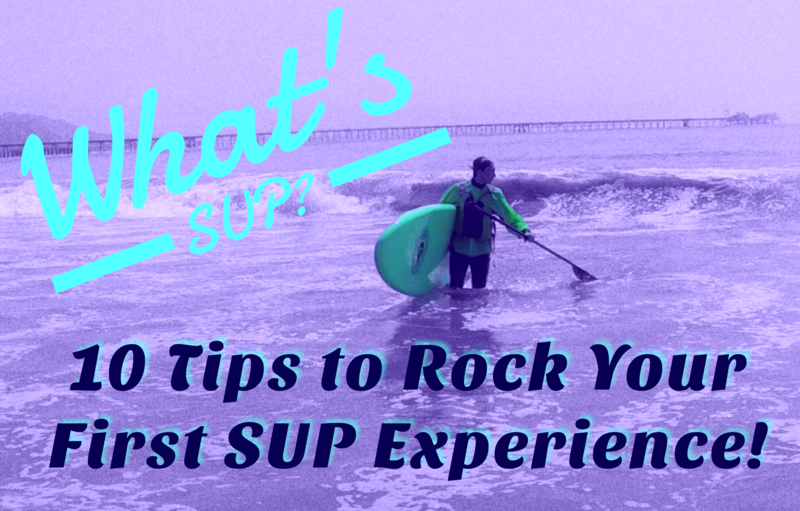 Here are 10 tips we gleaned that will help you have a super first SUP experience. SUP is best done in the mornings. The winds are generally calm, which means the ocean is calm. Glassy water is much more friendly for first-time SUPers. If you want to take a lesson—which we highly recommend (read below for more on that)—it’s good to book ahead. This way, the outfitter can be sure to have all the gear needed, as it’s all sized based on the paddler’s height, weight, and shoe size. 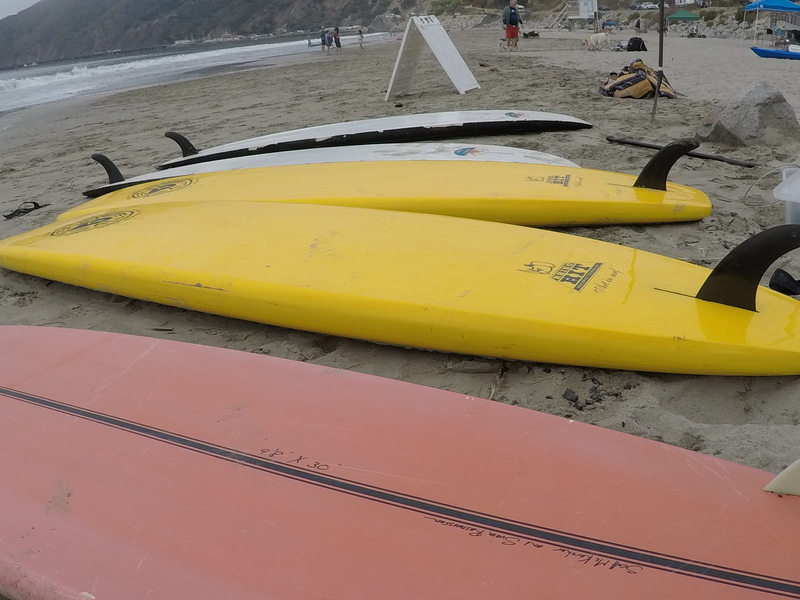 Our Stand-Up Paddleboards await on a cool foggy morning at the Avila dog beach. Especially if you have a group, call ahead to book your desired day. Also ask about minimum age requirements for children to SUP. If the outfitter offers rental gear (farmer john wetsuit, PFD, and booties), use it. It may cost a little bit more than just renting the board and paddle, but it’s worth it. Even if you have a surfing wetsuit, it will be restrictive and hot for the active nature of SUP. The morning of your trip, arrive at the designated location wearing a swimsuit of some type. As mentioned, because the wetsuits used for SUP aren’t skin-tight like surfing wetsuits, you can wear board shorts and other loose swim gear under your wetsuit. Tom gave us a land lesson before we headed into Avila Bay. 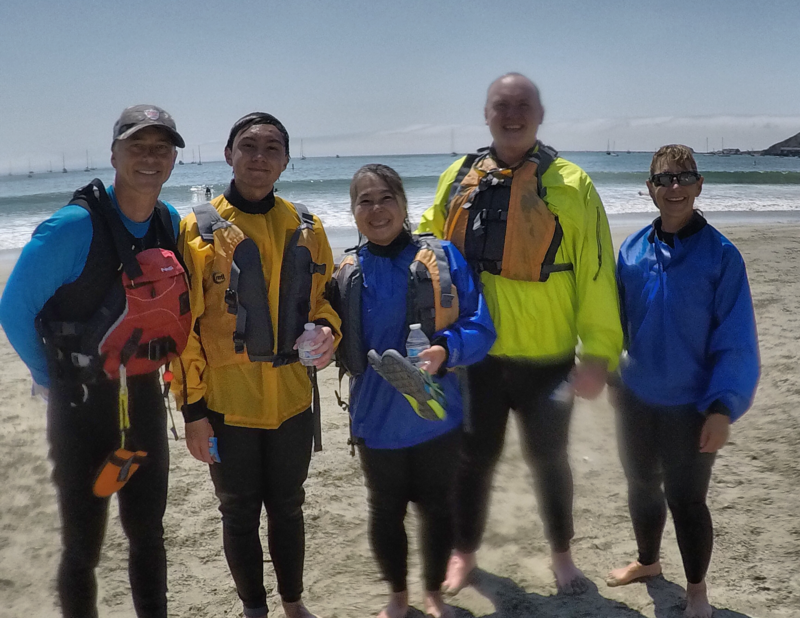 While some folks may just rent a board and paddle and then head into the water, I believe the good instruction we received beforehand helped everyone in our group have a great time. basic stances: prone, kneeling (and sometimes sitting), standing. Chris with Central Coast Kayaks was filled with positive energy and helped make for a great first SUP experience. In about 15 minutes, you’ll be ready to head into the waves and start your SUP adventure. Once you’re beyond the breaking waves and the swimming area designated by buoys, get onto your board in the kneeling position. Then play and explore a bit. Getting from the shore and paddling out past the breaking waves is our first chance to practice what we’ve learned on land. Use the paddle on both sides. Get used to the feel of the paddle, and how different movements affect the direction and speed of your board. Now it’s time for the standing-up part of SUP. SUP is all about balance, not strength or sheer athletic ability. If you’ve tried surfing, you know that the pop-up from prone to standing is crucial to success—and my goodness, is that an athletic move. Whew. With SUP, it’s quite easy to stand up on your board. From the kneeling position, first breathe. Breathing is very important in SUP (as in life). Put your hands on the paddle about shoulder width apart, and place the paddle across the board in front of your knees. Bring up one foot at a time in the place your knees were, and stand up. Verrrry slowly. Keep your knees bent, keep your weight centered, both side to side and underneath you, and keep a little more weight in your heels than your toes. If things get shaky, pause, keep your knees bent, breathe. Recenter and and try again. You very well may nail it and stand up on your first try, or it may take a couple times. But you’ll likely be standing on your board in about 15 minutes. Starting with kneeling is a good place to start your SUP adventure. Then, place one foot at a time on the board and slowly stand up. In no time, you’ll be SUPing! If your first attempts at standing up lead to falling off, it’s no big deal. Really. Like imploring the ocean to stop moving and finally realizing you can flow with the movement (more about that later), it’s also a huge relief when you discover how easy it is to get back on your board. Just shimmy your torso onto the board, reach across the board and hold the other side with your free hand, and put some weight onto that far edge. Pull yourself out of the water, and you’re back on your board. Easy peasy. If you didn’t fall off while trying to stand, now is the time to step off your board and practice getting back on. Doing this will boost your confidence a ton. Standing, falling, getting back on. It’s all easy and you’ll get the hang of it quickly. The paddle stroke is more about using our core than our arms. Practice taking long strokes and pulling the paddle out as it passes your foot. Play with turning, stopping, going backwards. Explore direction and steering. When you get that down, and you will quickly, try moving one foot in front the other a bit. This is a more advanced move for better steering and maneuverability. It may result in more practice getting on your board from the water, haha. And that’s a good thing. Go with the flow. The ocean doesn’t stop moving. I know, that sounds obvious, but at first your brain will be insisting that if the ocean will kindly stop moving, then you can stand up. It won’t. The sooner you accept that reality, the better. Instead of bracing against it, flow with it. It helps to hum a reggae tune in your head at this point, or sing. “Don’t Worry, Be Happy” is a good choice. Breathe. Remember to breathe low into your center. When you get tense, you may hold your breath and that makes everything else tense, and the Paddleboard juju does not like tense. Look up. Look where you want to go and the body will follow. If you look down at the board or at the water, the weight of your head will tip you forward and your body may end up at the place you’re looking: in the water. Keep your knees soft. You don’t have to paddle in a squat position the entire time, but not locking your knees helps you absorb the movement of the ocean. See Tip #6. If you need a break, you can kneel or even sit for a while. Smile. You’re SUPing! In the Pacific ocean! With the otters! And seals! For as long as you choose to put the paddle in the water and pull it back out, all that matters is the glide and ripples and the sounds. It doesn’t get much better than this. It’s easy to get out and try SUP on the Central Coast. Just book a lesson, reserve your gear, meet your outfitter on the beach, and get ready to have one of the most fun, relaxing, rewarding experiences possible. Let the ripples quiet your mind as time slows down. 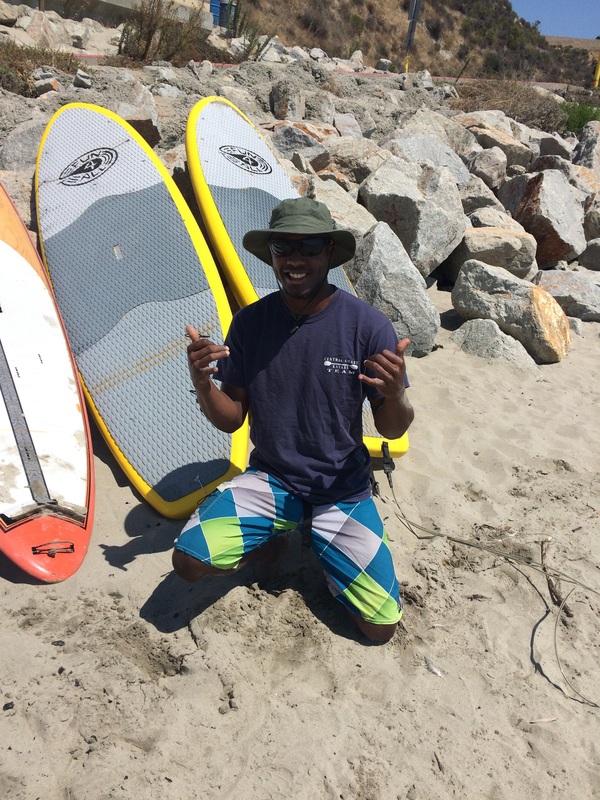 We’re all smiles after our first Stand-Up Paddleboarding experience in Avila. Thanks Tom and Central Coast Kayaks! We’ll be back for more SUPer times! 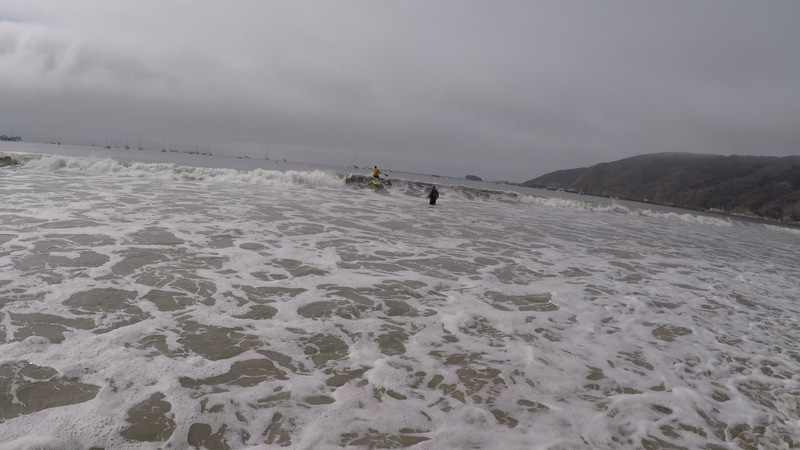 Say hello to the otters and watch the mesmerizing sway of the kelp as you become one with your board and your paddle becomes your engine. Breathe, and explore the simple joys that SUP can offer. Here are a few local companies that provide SUP rentals and lessons.